As you build up an audience for your website, you start to realize there’s a whole world to explore outside of AdSense for monetization. However, first, you need to pick an ad server, in the early days, most small publishers didn’t require an ad server, in many cases just implementing AdSense or joining an ad network would suffice. However, to truly take your ad revenue strategy to the next level you need to implement an ad server and take full control of your ad inventory. Advertising servers help publishers in many ways and make managing ads simple. They allow you to set up a variety of ad units, make advertisers compete, create stronger audience targeting, deliver advanced reporting and much much more. In this ad server comparison guide, you’ll get all the information you need to take your next step towards publisher success. Choosing the best fit ad server for your business is an important and challenging decision. Sign up to MonetizeMore to get a personalized ad server recommendation. The following products represent the best of 3rd party ad servers available in 2019. The first server on our list is one of the best and well known in the market. It hosts a long list of impressive features, is the preferred option for many premium publishers and is called the DFP ad server (DoubleClick For Publishers). Recently, after Google rebranded its advertising products, DFP was put under the umbrella of Google Ad Manager together with Ad Exchange. DFP advertising solutions offer a range of great features such as Ad Exchange dynamic allocation, simple reporting and management tools, vast monetization options and reliability. Two versions of this server exist. The first version is the small business version which caters to small-time users which is free of charge. The second DFP version is more robust and aimed at premium publishers. For publishers with websites generating 5 million page views or earning more than $5000 of income per month, MonetizeMore is offering a free DFP setup. OpenX is a highly functional platform that provides its users with a real-time auction of advertising space on reputable and famous publisher sites. The company delivers product offerings to both advertisers and publishers. Reports have indicated that 96% of AdAge’s leading national advertisers use OpenX. Some of these companies include famous brands such as Electronic Arts, Samsung, and CBS Interactive. From a publisher perspective, the OpenX advertising server helps publishers to take full control over programmatic and direct campaigns. Publishers can manage their ad inventory across multiple formats while maximizing returns, conduct forecasting and, enjoying advanced reporting functionalities. Click here to find out more about OpenX. AdZerk offers members of the ad industry a unique and custom solution unlike any other. With the AdZerk API, users can build custom online ad serving platforms to cater to their own specific needs. The AdZerk API allows them to build a server fast, all while costing much less than creating an entirely new platform. They also provide all the necessary features such as giving full campaign control, increasing revenues, reporting capabilities and more. With AdZerk’s white label product offerings, you can have a working publisher ad server up and running in a matter of weeks. This unique product works so well that some of the most popular websites in the world including Bed Bath & Beyond, WattPad, Tradingview and more use it. Click here for more information about AdZerk. Zedo was founded as early as 1999 and was one of the first companies to implement the self-service advertising module in multiple languages. Even today, it features one of the best direct sales tools in the market. Besides being one of the oldest ad serving tools and the biggest independent solutions still in use, Zedo provides a long list of features for publishers. These include ad tracking, serving, planning & reporting, API integrations as well as expert customer services online 24/7. Click here for more information about the features Zedo provides. With Verizon Media’s ad server, publishers can gain access to advanced management and ad serving functionalities for the entire digital advertising landscape. You can efficiently manage campaigns across traffic types like display, video, and mobile with Verizon’s technology. Benefits of using the Verizon Media ad server are many. Publishers can expect a streamlined workflow which enabling them to manage complex processes in real time with accurate forecasting tools. Furthermore, publishers can enjoy advance mobile targeting, cross-screen monetization, effective and simple programmatic management, accurate inventory management and more. Verizon Media’s ad-related services consist of a team with over 15 years of ad tech experience, they serve worldwide clients and serve over 200 billion ad requests per month. Click here for more information about Verizon Media. The Broadstreet ad server is best suited for small-medium sized businesses, local news and magazine styled sites which focus on direct sales. For niche publishers, Broad Street can be the perfect fit. They help their clients provide as much value possible to advertisers thereby improving efficiency and overall performance. With the Broad Street platform you can expect ease of use (little additional learning curve for previous DFP or OpenX users), automated reporting to make delivering reports to clients effortless, sponsored content analytics, newsletter advertising management via your dashboard and even a white labeling option. Click here for more information about Broad Street. AdGear is an ad tech solutions company that provides publishers with a range of services such as ad serving, RTB, analytics, DSP and more. In 2016 Samsung acquired the Canadian based company in support of Samsung’s Smart TV services. It now focuses on connecting Samsung OTT/CTV audiences to advertisers. The AdGear team is highly responsive and stays up to date on any industry trends while continuously improving its products and preventing fraud. Click here to find out more about Ad Gear. Aerserv is a mobile-focused monetization company that was recently acquired by InMobi, a global advertising platform. With Aerserv’s range of publisher products, it’s able to assist in monetizing mobile and in-app traffic with its ad inventory management systems, audience monetization, programmatic brand demand, and yield optimization technology. It also provides users access to AerMarket, Aerserv’s ad exchange. Aerserv is an excellent option for mobile publishers as they aim to differentiate themselves from competitors with state of the art technology focused on mobile and app publishers. Furthermore, each client that joins Aerserve becomes a close partner as their goal is to build long-term relationships with their clients serving every need possible. They help publishers with every step of the process from setup to monetization and provide regular support afterward. Click here to learn more about Aerserve and its product offerings. The team from the Smart Ad Server has more than 17 years of experience in building ad technologies. With their ad server, publishers can run either programmatic or direct campaigns through all digital formats and different screen sizes. Publishers can optimize monetization with a unified auction process that helps them to maximize revenue from each ad impression. Their ad server is one of the most feature-rich options available on the market. Some of the features include simple cross-platform trafficking, granular reporting, advanced targeting, a real-time forecasting tool, flexible ad building and more. Click here to learn more about the Smart Ad Server. When looking through our list of ad servers, keeping your individual needs in mind is very important. Many of the companies listed above have different specialties and features. Some are aimed at small-medium sized publishers while others cater only to premium websites. If you are having trouble deciding which ad server companies would fit your business best, be sure to read our article on “How to Choose the Right Advertising Server for your Site” before making your decision. 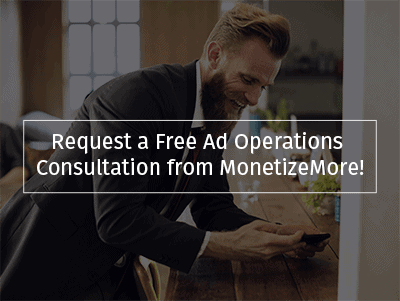 For more technical advice, be sure to contact the MonetizeMore support staff to get answers to any other ad optimization, Google Ad Manager or Ad Exchange related questions. What’s your programmatic revenue strategy for 2019? At MonetizeMore, we help publishers get more revenue from their existing ad inventory. We’re a leading Google Publishing Partner with a suite of publisher monetization solutions that helps our clients reach revenue targets and solve ad operations headaches. The above ad servers are a good start to narrow down the best-fit ad server for your business. However, choosing the right ad server requires a customized analysis and recommendation from an expert. Sign up to MonetizeMore to get a personalized ad server recommendation. When Is the Right Time to Implement Third Party Ad Serving? I’d like to add one more ad server solution that may be of interested too. AdGlare is a scalable ad server in the cloud, both for publishers and advertisers. It offers a 15-day trial and a white label for ad serving from your own subdomains. As a relative new platform (since 2013?) it supports auto-responsive ad formats for mobile devices. Costs: $49/month for a 2 million request plan, or free of charge for the Community Edition. I’d like to update another information that might sounds good too! dJAX is one of the leading service provider of Ad serving Technology and good expertise in handling ad server projects across the Globe. dJAX build the ad server for display, mobile and video platform with latest targeting and reporting features which supports to run your own ad network with our technology. It has separate dashboard for admin, advertisers and publishers where you can act as an admin and can manage N number of advertisers and publishers under you. dJAX ad server platform is a onetime setup cost and will deployable in your own server where you can run it with your brand name and logo.